Jesus never assumed the title of Son of God… true or false? Many Muslim friends tell me this, but it is not true. Jesus repeatedly affirmed that he is the only Son of God. One day he asked his disciples, “Who do you say that I am? A question to which Simon Peter replied: “You are the Christ, the Son of the living God.” Jesus answering said to him, “You are blessed, Simon, for it is not flesh and blood that have revealed this to you, but it is my Father who is in heaven “(Matthew 16: 15-17). When he was arrested, his religious detractors asked him, “Are you the Son of God? To this Jesus answered, “You say it. I am.” (Luke 22:70). They at once accused him of blasphemy and demanded his crucifixion. In other passages, Jesus addressed God by calling him “My Father” (Abba), proving by this that he was indeed the (unique) Son of God. He said, “My Father gives you the true bread from heaven … All that the Father gives me will come to me, and I will not put out who comes to me … The will of the one who sent me, is that whoever sees the Son and believes in him has eternal life; And I will raise him up on the last day “(John 6:33, 37, 40). Elsewhere, Jesus said to his disciples, “He who has seen me has seen the Father … Believe me, I am in the Father, and the Father is in me” (John 14: 1-11). One day, the Jews questioned him and asked him, “If you are the Christ, tell us frankly.” Jesus answered them, “I have told you, and you do not believe. I and the Father are one.” Then the Jews took stones to stone him. But Jesus said to them, “I have shown you many good works from my Father; For which do you stone me? 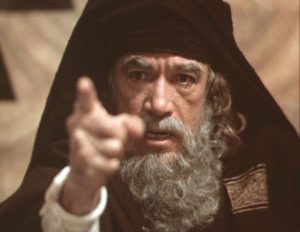 The Jews answered him, “It is not for a good work that we stoned you, but for blasphemy, and because you, who are a man, make you God.” “Jesus said to them,” Is it not written in your law, I said, Are ye gods? If she called gods those to whom the word of God was addressed, and if the Scripture can not be annihilated, the one whom the Father sanctified and sent into the world, you say to him: You blaspheme! And because I said, I am the Son of God.” (John 10: 22-36). A powerful argument is this: when accused of blasphemy, the worst sin that Jesus could be accused of, He didn’t protest that they had totally misunderstood His meaning. This is proof that Jesus fully intended to state without any hesitation that He is the eternal Son of God.